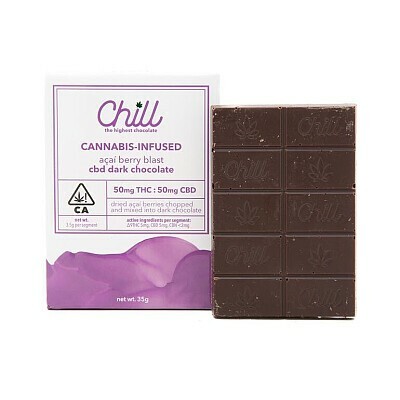 CHILL The Highest Chocolate fuses decadent, creamy cocoa with the exotic sweetness of the popular acai berry with the Chill Acai Berry Blast CBD Dark Chocolate. This rich chocolate bar is crafted with CO2-extracted cannabis oil and contains 100 mg of CBD per bar. Handmade with ethically sourced, high-quality ingredients, you'll be remiss to let CHILL's award-winning infused chocolates pass you by.